Benjamin Ginsberg and Matthew Crenson, professors of political science and co-authors of the book, "Downsizing Democracy: How America Sidelined Its Citizens and Privatized Its Public," (Johns Hopkins University Press, 2002), are currently working on another collaboration, this time a look at the growing power of the U.S. Presidency. 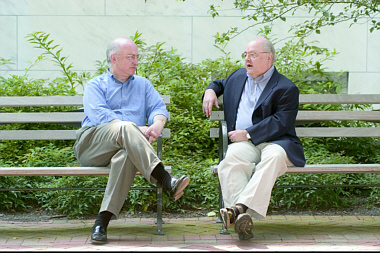 They recently sat down to talk about their book and the 2004 Presidential race. The following is an edited version of their conversation. power of the presidency, the subject of their next book. It's about why even though presidents for the last generation have all been embattled, for one reason or another — because of the Vietnam War, because of Watergate, because of Monica Lewinsky, because of the abduction of U.S. diplomats in Iran — nevertheless the power of the presidency has continued to increase. Even though we have all of these supposedly failed presidents, the Presidency grows more powerful, and we try to answer the question why. And the answer has two parts. One is that in order to become president today, as opposed to the 19th century, you have to be almost insanely ambitious. It used to be that people were nominated on the 36th ballot and came out of nowhere and all of sudden they were presidential candidates. Now you have to go through a grueling process, not just the primaries but public exposure. You have to have a very thick skin. You have to be extremely ambitious. So it's changed the character of presidents. And the other thing that's happened is participation in American politics has gone down, which is what Ben and I talk about in our previous book. And the result of that is to disempower those branches of government that depend on popular mobilization, most notably Congress. The president has within his power the wherewithal to carry out his own wishes. Congress has to rely on the executive to carry its will, and the only thing it has working for it is popular support. That's the only way it can keep the president under control. As Matt indicated, this book is an outgrowth of our previous collaboration, Downsizing Democracy, which we did with Hopkins Press in 2002. And when we finished that collaboration, we were a little tired of talking to one another, but we had an idea, and that is, the things we talked about in that book, namely the sharp decline in popular political involvement, had institutional consequences that neither we nor other scholars had really fully appreciated. And we conducted with one another a little thought experiment and it was really inspired by the events of 2002. If you recall, there was an attack on the Congress, the anthrax attack on the Congress, which resulted in Capitol Hill being closed for a long period of time. If you walked over to the hill, it was rather eerie. It was empty except for security guards. And yet, unless you happened to live in Washington, you never noticed this. The government of the United States went on. Congress was sort of irrelevant to things. So that inspired a little thought experiment on our parts; namely, if you imagine a polity in which popular participation is widespread, in which groups are actively and busily involved in the political process. In that kind of setting, both president and Congress might benefit. Presidents like to be popular, but basically that would be a setting in which Congress would be busy and active. If on the other hand you imagine a polity in which no one participates, there's not much politics at all. Congress would have nothing to do. The president wouldn't care, because the president controls armies and bureaucracies and can govern without a single person participating. I think you would have to call it a King, but nevertheless, he would work perfectly well. And which of these two polities is closer to the United States? Well, unfortunately we're heading in the direction of the second, in which participation is low and presidents have been the beneficiaries of that change. You can see how the presidents have attempted to capitalize on that. Look at the way the war in Iraq has been fought. Rumsfeld's idea is to keep the number of troops very low, to make up for numbers with high- tech targeted weaponry. In a way, it sort of takes the whole war out of the public sphere. It means you don't have to draft a lot of people. It means you don't have to go to Congress for a lot of stuff. The whole thing can be carried on within the executive branch. That's one of many examples of the same thing. If anything, we were surprised at the extent to which the president in recent decades has become capable of governing unilaterally, though we had some sense of this. As we did our research, we learned more and more about it. For example, presidents rely very heavily these days on executive orders. They rely very heavily on something called regulatory review, making use of an agency that hardly anybody in the United States has ever heard of, an agency called OIRA, the Office of Information and Regulatory Assessment. And if you google OIRA, you get very few hits. Well, OIRA, which is an office within the White House Office of Management and Budget, is charged with overseeing the president's regulatory agenda. Presidents today, President Bush, before him President Clinton, before him the former Bush, President Reagan — these presidents have claimed the right to submit through OIRA, a regulatory agenda to the federal bureaucracy ordering bureaucratic agencies to engage in rulemaking processes to bring about the implementation of the president's agenda. In other words, they tell agencies what rules and regulations to adopt. Now this might not seem very important, unless you realize that in our system of government, Congress enacts a small number of rather vague pieces of legislation every year. So the Congress wants to clean up the environment, for example, Congress passes a bill that says, 'The environment shall be clean." And then appropriates a lot of money, which it gives to various agencies, including the Environmental Protection Agency, and says, "Do something about it. Clean up the environment." Well the agency proceeds to write thousands and thousands of pages of rules and regulations, which have the force of law. The courts treat these as law. Well if the president can control that rulemaking process, he can write the law himself. He doesn't need Congress. And that's what presidents have done. For example, President Clinton, as he was being impeached and as he couldn't get anything through Congress — he couldn't have had the Marigold declared the national flower — President Clinton had most of his environmental agenda written into law, through rules and regulations. Another great example of this, right at the end of his administration, Clinton set aside millions of acres of land in the West as wilderness reserve, by executive order. And a bunch of those Western governors sued the federal government to get that reversed. The president and the solicitor general intervened in the case, but not on the side of the Western governors. They intervened in the case to preserve the president's power to do that whenever he wanted. And he kept it. And what this means is it's really important who gets to be president, because today the president is more powerful than he's ever been, more able to act unilaterally than ever before. And yet participation has been very low. Yeah, and we Americans are so accustomed to viewing democratic government in a particular way. We are very concerned with leadership selection. Every time there is an election, everyone takes notice. And the news media suddenly forget about Janet Jackson's breast and focus in on the election. But that's what we think is important. We think about democratic politics, but not democratic governance. We can elect a president every four years and yet the presidency is not a very democratic institution, because presidents exercise power in often very secret ways, in covert ways, in ways we don't know anything about. Presidents take issues out of politics. A lot of executive orders, in fact, are secret. They have to do with national security. Right, Congress enacted a piece of legislation called the CASE Act in the 1970s, which required presidents to submit to them a list of all the executive orders they issued during the previous year. Well, presidents responded by changing the name of executive orders to other things, so Congress still has no idea. Yeah, when we watch these movies in which there are national security findings. Those are executive orders by another name. That's an executive order by which the president says, "It's not Congress' business what I did." They also set up something I find really fascinating. It's called the signing statement. It was invented by the Attorney General Ed Meese in the Reagan administration. And it's a wrinkle on the presidential veto. The Constitution says, if the president vetoes a bill, when Congress is in session, the president has to send a veto message to Congress. So what the presidents started doing on a regular basis, starting with Reagan, was to write a statement, even when they signed a bill, explaining how they interpreted the legislation. Then they got this published and it becomes part of the legislative history that's used to interpret the law and what these signing statements often say is, "I believe ... I'm going to sign this piece of legislation, but I think that sections 101 and 105 are unconstitutional and I won't enforce them." So in 2002, when it passed the appropriations for the budget for the Justice Department, Congress added a provision, which said, if the executive branch is not enforcing provisions of federal law, because it says it thinks they're unconstitutional, then it has to inform the Congress. So President Bush signed it, then he wrote a signing statement that said, he would tell Congress whether they were enforcing the law, unless it was against national security, executive privilege, the president's control of bureaucratic agencies and about three other items. So in effect, he said, "No dice." Some ways in which presidential power has increased have become very evident in recent years. And this clearly is the case with presidential war power. The Constitution gives Congress the power to declare war, and yet Congress has not declared war since December 1941. December the 8th 1941, to be exact. But we've been at war many times since then. We've had a lot of casualties since December the 8th 1941, so who in the world sent American troops into war? Well, of course, it was the president. And presidents have gradually taken hold of the war power to the point that Congress plays a very little role now, and this started during the Truman administration, when the North Koreans invaded South Korea. Congress was ready to declare war. But President Truman's advisors urged him not to ask Congress for a declaration of war, but instead to go to war on his own authority, in order to begin to establish the principle that it was the president and not the Congress who possessed the war power. And Truman did just that. The leadership of Congress came to him and said, "But we want to declare war," and he said, "No. I'm sending the troops to war." So, since that time, presidents have every year expanded the war power. Congress finally in 1973 enacted the War Powers Act, which created a mechanism through which Congress nominally was to take back some of the war power. But of course as critics pointed out, the War Powers Act gave the president powers that weren't in the Constitution. The Constitution did not say that the president can go to war for 30 days — it's 90 days altogether, 30 days and then 60. So the Constitution doesn't say 30 days, it doesn't say 60 days, it doesn't say 90 days, it says Congress declares war. But presidents didn't like the War Powers Act, either, and made a determined effort to eliminate it, most particularly President Reagan who embarked on a policy of what we call in the book, "successful fait accompli". In other words, Reagan endeavored to use American military forces in ways that would be popular and successful and that Congress couldn't oppose. And each time he did so that would be a precedent for subsequent use. So the classical example is the invasion of Grenada, where American forces occupied Grenada for reasons that never made too much sense. We were preventing the Cubans from building an airstrip there. But when Congress objected, President Reagan said American forces had gone there to rescue American medical students, who were rescued whether they wanted to be rescued or not, but the first medical student off the returning aircraft, knelt on the tarmac, and said, "Thank God for President Reagan. He saved us." And Congress said, "Oh. All right, you can invade Grenada, but don't do anything else." But of course, presidents did a lot of other things. President Reagan sent troops to Lebanon. The first President Bush invaded Panama and resisted the Iraqi invasion of Kuwait. President Clinton went to war in Bosnia, even though Congress was totally opposed. President Clinton got NATO approval and if NATO hadn't approved, he would have gone to the Rotary Club. And, of course, the most recent President Bush went to war in Iraq. No one has ever mentioned war powers. The War Powers Act is a dead letter. Congress has never been asked to declare war. We've had these rather mechanical votes to authorize presidential action. But each president has made it a point to assert that he didn't need congressional approval, was going to war anyway and if Congress wanted to approve, that was nice. Yeah, this time the resolution came up for a vote in October, 2002, one month before the Congressional elections, putting them on the spot. The other thing is, that under the War Powers Act, after American forces have been committed for 30 days, it's very difficult to just pull them out. It's the kind of window you can't unbreak. Q: Do either of you see anything distinguishing about this race from previous races? Well, we have a war. We have an economic downturn. It's just like every other presidential race. There's one distinctive thing about this election. There are very few undecideds [compared to] previous elections. I think one in 10. Everyone else has made up his mind. In fact, you wonder why we bother to go through all of the preliminaries, because the candidates were already nominated long before the conventions. People had already made up their minds. We might as well have it out right now, instead of having a campaign. It's very curious because a record amount of money will be raised and spent in this election to change the minds of a very tiny number of voters. Q: Speaking of voter turnout, I imagine the trend will continue and we'll have fewer people voting in this election? It's hard to say. If you go by the Democratic primaries, turnout wasn't actually that high. It was very low in the Democratic primaries. I think that's why people are pessimistic about turnout. So far, there's no sign that the polarization of the electorate will be translated into higher turnout. One of the interesting things about this race and other recent races, as a political scientist at Carleton College, Steven Schier, points out, neither party makes much effort to reach out to new voters, to really make much of an effort to register new voters. Each party is primarily concerned with activating its base. And that's one reason the last election was so close. The two parties are fairly evenly divided in the electorate and if they don't reach beyond their solid cores, than we'll see low turnout and a fairly close election. I think this is one election where there's been a lot of talk about the Internet in politics and how it's going to democratize the country. I think this is one election where we're going to see there's another side to the Internet. What you can do on the Internet is to target your message to specific niches of people who choose you. Ben has a nice phrase: It's not just the people who choose the president; the president chooses who the voters are going to be by targeting these different populations. And so you get to craft an electorate the way you want it and that's not a way to expand participation, but to control it. Yeah, two other noteworthy elements of this election. One has to do with election law and one has to do the sort of pre-election skirmishing, if you will. The so-called McCain-Feingold Act, which became known as BICRA, the Bipartisan Campaign Reform Act, has turned out to be a very important piece of electoral engineering for the Democrats. BICRA, as you know, outlaws so-called soft money, that is, money contributed directly to the political parties. Soft money was the conduit for tens or even hundreds of millions of dollars in campaign contributions, mainly from corporate America and mainly to the Republican party. In place of soft money, we now have money raised by so-called 527 groups and these are named for the section of the Internal Revenue code that defines them. These are nonpartisan, issue advocacy groups. Now 527s have turned out to be major vehicles through which wealthy individuals are able to contribute unlimited amounts of money and this has benefited the Democratic Party, because corporations are reluctant to form 527s because of potential tax complications. A 527 is a nonprofit. Although it's technically possible for a corporation to form a subsidiary that is a 527, the chances of that bringing an audit are very high, if you do that. So in this election, the Democratic Party has been able to raise about as much money as the Republicans. It's wiped out the advantage. The Republicans are sort of mobilizing and setting up their own 527s. It's true. There's plenty of Democratic soft money, too, but that fundraising procedure mainly benefited the Republicans and the new one mainly benefits the Democrats and has created a fairly level financial playing field. The other interesting phenomenon in this election was, I would say, the 9/11 commission. In recent years, each party has endeavored to create investigative mechanisms to discredit presidents of the other party. So if you go back a few years, Democrats created the Watergate commission and the Iran Contra investigation. Republicans, of course, created an impeachment process and the special prosecutor to investigate Clinton. Well, in this particular race, Democrats had a serious problem and that is they didn't control either house of Congress, which meant they didn't have investigative machinery with which to attack Bush. The Democrats were extremely clever. They were able to set up an ad hoc machine, namely the 9/11 commission and Democrats were, I think, more politically astute than Republicans in their appointment of commission members. The Democrats were able to place on the commission at least two very rigorous former prosecutors, who I think were able to turn the 9/11 commission into a fairly effective forum designed to diminish Bush's advantage in the realm of national security. They were able to show that the Bush administration had not been as vigilant as it should have been. Of course, the problem for the Democrats was that this was not a congressional committee, but was an ad hoc procedure; it's gone out of business already. But what the Republicans didn't figure on when they set the July 30 reporting day is that they would have to act or respond in some way to the results of this report and right before the Democratic Convention. So I think even though it's not a congressional body, Congress is already going to stay in session until August to discuss its recommendations. The president has now announced that he will try to enact as much of this as he can, through executive orders without going to Congress. The best illustration I saw during the hearings of the prosecutorial bent, when Richard Ben-Veniste asked Condoleezza Rice to read the title of the briefing that came in almost one month before Sept.11. That's an old prosecutor trick to put something in the mouth of the witness, something that you want to come out. After that she was somewhat wounded for the rest of the hearing. Ben-Veniste has little or no experience in the realm of intelligence, but he's a great prosecutor. That was a very interesting strategy on the part of the Democrats, because, until that time, if you read the polls, Bush had a commanding lead over the Democrats on the issue of national security. With that commission and its findings and the tactics of the prosecutors, the Democrats were able to erode Bush's standing. Of course, Bush eroded his own standing through the conduct of the Iraq war. The Iraq war was a great military success, but it has been a political failure. The stated goals of the war, to seize weapons of mass destruction, turned out to be untrue or a mistake and there continue to be casualties. That has wounded the president grievously. But not in the right states. Why? Because it wounded him in the shoulder, but not in Montana? Because of changes in population, distribution of population, states that Al Gore carried in 2000 have lost population and, therefore, lost electoral votes. So even if the states come out the same this time, the margin of electoral votes between Bush and Kerry would be even bigger. Kerry has to pick up states that Gore didn't win, in order to win this election. Q: What are some of those states? If he can carry Ohio and Illinois, there's a good chance he'll win. But President Bush has been to Ohio something like 22 times. Q: With things being so close, is it possible to see a repeat of 2000, in terms of the election being contested? I think we're going to see some disputed votes. The new touch-screen voting machines have some fatal defects. They're accessible to hackers, but the biggest deficiency is they don't leave a paper trail, so, in fact, it's impossible to conduct an independent recount, when you cast your votes. People argued about chads in 2000, but in 2004 we will be looking for electrons. The problem for the Democrats, as Matt has indicated, the sort of "getting electoral vote mentality," gives Bush the advantage. The Democrats have to win states that they didn't in 2000, and if the Republicans simply hold on to what they had, they will win. Now, the difference is significant, but not insurmountable. Yet if you had to handicap the race, you would make Bush a slight favorite, whatever the polls are saying at the moment. I think I would have to go along with that. If I were a betting man, I would demand odds if I were going to bet on Kerry. Q: Was it to the Democrats' advantage to hold their convention in July? I think it was. Granted, there is the difficulty that you no longer, under the election laws, you no longer can raise money after you accept the nomination. But this is one place where the Republicans made a very bad mistake. First, they have Kerry campaigning all of this time, but the time and place of the convention, the Republican convention, is going to become a liability. This might be the place where Kerry has the opportunity to strike. Holding the convention in New York, just a short time before Sept. 11, is going to look. First of all, it looks like the president is doing exactly what the Democrats accuse him of doing, capitalizing on 9/11. But holding the convention in New York means that, it's a city that's generally hostile to Republicans, even though they've been voting for Republican mayors for quite some time. But where there's going to be a lot of protestors. It's going to be a mess. I think that was a very bad idea. But it seemed like a good idea at the time. At the time, it was a very important gesture toward New York City, which had been the victim of a terrible terrorist attack. And it was a very popular decision at the time it was made, but in the context of 2004, it turns out to have been a bad idea. There will be protests; there will be disruptions. The media will focus on the protests and disruption. And there going to be going to the Democratic candidate and asking for his reaction to what's going on. Although the tradition is that neither side snipes at the other side's convention. It's not sniping if you're asked. But at the same time we're talking about marginalia, because, in point of fact, the only people who pay attention to the Democratic Convention are Democrats and the only who pay attention to the Republican Convention are Republicans. These are pep rallies. If there are serious demonstrations and serious controversy surrounding the Republican Convention, I think the Democrats will start to watch. Just as the Republicans tuned in in 1968 and cheered on the Chicago police. Q: Thinking about the debates, presidential and vice presidential, do you have any thoughts on how they will do and how that might affect the outcome of the election? I have a couple of thoughts. One is that, the impact of the debates is relatively small in this particular electorate. This is an electorate whose partisan views are very strong and where you're not going to change a lot of minds. And in that context, unless one or the other candidate, does really, really, really horribly, each candidate's partisans will come away feeling that their champion has won. Now, you know, I always love to ask people the day after the debate, who do you think won? And wouldn't you know it, the Republicans think the Republican won and Democrats think the Democrat won. The one time this wasn't true was the first presidential debate in 1984 when poor Ronald Reagan, obviously was suffering first attacks of Alzheimer's; he just sounded horrible. He was terrible. And even the most committed Republican partisan could not say he had won. However, after the second debate, when he was merely dreadful, people said, "Oh, you see." This is the expectations game. I don't think the debates will have much impact. My other thought is, Bush is not a very effective debater. In the 2000 race, he managed to survive the first debate only because Al Gore was such a jerk and was presented correctly that way by the media. So people forgot about Bush's ineptitude. They just remembered what a jerk Al Gore had been. And of course nobody watches anything but the first debate. So Kerry's not a jerk. He'll be very presentable, so it's hard to believe that a fair-minded person will walk away thinking that Bush was a brilliant debater. But there aren't that many fair-minded people. Unless Bush thinks Poland is not communist. [a reference to a Ford-Carter debate in 1976]. He would have to make some terrible gaffe. And he's smart enough — if you're that inarticulate, you're not going to say something really, really stupid, that's one of the advantages of being inarticulate. And the Bush people now are accustomed to dealing with Bushisms, so that any time there is a gaffe, they turn it into a joke the next day. Q: In terms of issues of events that may play a role in the election, do you see any that may be decisive in this race? Well, the war could play an important role. Right now the war, I won't say is off the front pages, but the salience of war news has gone down. Yeah, casualties have sort of gone down. There are attacks, but the attacks are directed against the Iraqis primarily. Kidnappings against foreigners, but no American soldiers. Things are going fairly well in Iraq. We've turned over nominal power to an Iraqi administration. That's very helpful politically, even though it's a political myth. Just as in Afghanistan there's a myth of an independent Afghanistan regime. But nevertheless, what people read in the paper is that the Afghan president did this, that or the other, not that the American general who runs things and the same thing is starting to happen in Iraq. Unless there is another change for the worse in Iraq, I think that's going to start helping the president. I don't know if it's going to help him, but it's less damaging. I'm starting to see a little bit of a change in media coverage, even in the New York Times today, which is hardly a bastion of Bush support, there's a story about democracy in Iraq. You know, democracy in Iraq, I'm doubtful about it, but nevertheless, that kind of coverage can help the president. Now a terrorist attack is a wild card and the effect of that could go either way. It could be that it would inspire such fear that it will make people want to keep the president they've got, because we can't afford to make any changes in the middle of such a crisis. On the other hand, it could be seen as a failure of Bush's homeland security policies. My guess is that a terrorist attack would work to the benefit of the administration, because it's true people would say, lookit, we've spent billions on homeland security and nevertheless. But I think that people are not under the illusion that security can be perfect and what they do know is that Bush has a very aggressive posture. Bush believes in preemptive strikes; Bush conquered Afghanistan and Iraq. And you know, that's an area where people traditionally have more confidence in the Republicans. The other thing is that, the immediate response of the media to any such attack would be focused on the president right away, the president's response and Kerry would be off to the side. And what can Kerry say? If he attacks the president, he's probably just going to hurt himself, because he will look like somebody tearing down the country and the president in a time of great tragedy. So as much as I hate to say it, I think a terrorist attack would probably work to the advantage of the current administration. And as Matt says, if there was an attack, the president would be the focus of attention. The president would take action. He would do something. That's a wild card. The economy does what it's going to do. There's a business cycle. Both parties try to screw it up in different ways. I have a slogan: It's "The Stupid Economy," It's just sort of chugging along at a slow rate, generating mediocre jobs, but it's probably not going to play a decisive role. There's been an upturn. It's not a great upturn. I'm a terrible prognosticator, but I would say right now, I would put my money on Bush. But the war could go badly. It's a close election. There are various factors that will decide the outcome and not all have been seen yet. Q: Ralph Nader is still trying to get on the ballot. And the Republicans are helping him, because Republican love for Ralph Nader is well known. He's not going to get as many votes as he did last time. For one thing, he's not running as the candidate for the Green Party, for whatever that's worth. Also I think that liberal Democrats who were tempted to vote for him last time have seen what happens in that case and, except for a few stubborn ones, I don't think he'll get nearly as many. Right now, I think he's going to get about 2 percent. If he got 2 percent, he would affect the outcome. It's the red state, blue state problem. The other interesting thing to talk about is the vice presidency. Kerry was widely praised for selecting Edwards, who is a strong fund raiser. But I thought that was a very unimaginative choice and I think, historically, the vice presidential candidate is only good for, at most, his home state's electoral votes. I don't believe the Democrats can carry North Carolina, so I think that was a waste. Edwards is just such a conventional choice to me. I knew that you did. I don't think that Kerry had any choice. Edwards was the person who led the polls among Democrats. If Kerry had chosen some other candidate he was considering, like Gephardt or the guy from Iowa, it would have been charged that he was afraid of Edwards' charisma. So I really think he had to choose Edwards. But the fact is that who gets chosen as vice president has almost never made any difference to the outcome of the presidential election. The only exception was Lyndon Johnson in 1960. Well he was good for Texas' electoral votes. I can't think of any other presidential election. I think that's true. As things now look, this will be such a close race. He could have chosen [Pennsylvania Gov. Ed] Rendell, but Rendell wasn't under consideration. Or what's his name in Florida? Anyway, I thought that was a conventional choice. And Edwards is supposed to be such a sparkling candidate, but he's disappeared in the general media. The media don't follow the vice presidents around very much. Money, it turned out, the Democrats didn't need. They had all the money they could possibly use this year. And North Carolina's electoral votes aren't really in play, no matter what Edwards does. I still think it was unavoidable. Bush, on the other hand, there's always been a lot of talk that Cheney would discover that his heart condition was too severe. I think it's probably not going to happen, but that certainly would be interesting, because there are Republican choices that would be possibly more helpful than Cheney. The people who plan presidential elections don't plan to make them interesting. That's true. That's absolutely true.